The Biomedical Waste Incinerator is Used for Incineration of each type of Bio Medical Waste. The Disposal of Such Bio Medical waste is a Very Important as it is a Dangerous Wastes for Human Life, and it is only possible with a Perfect Incinerator. Biomedical Waste Incinerator is Used Widely in Hospitals, Medical Collages & Medical Waste Managing Companies who collect the waste and incinerate it in Bio Medical Waste Incinerator. 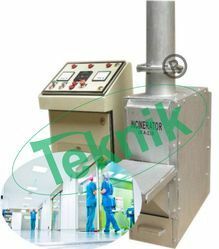 Looking for Bio Medical Waste Incinerator for Hospital Waste ?